Everyone suspected the government conducted secret intelligence gathering on U.S. citizens with the goal of obtaining every bit if information on the entire population. No one knew the secret program had gone horribly wrong until it was too late. A few years from now an American conflict is born in the shadows of a failed security crisis and illegal information trade, The Data Wars. Rising to meet the challenge of protecting American freedoms U.S. Senator Porter Chapman of North Carolina drafts a new controversial landmark law promising greater privacy rights for all citizens. That new law becomes The 44th Amendment: The American Way. The powerful and persuading Senator Chapman controls the U.S. Senate and his new party, but late in his career only one thing stands in front of knowing who killed his beloved and much younger second wife Emily, The 44th Amendment. Will he unravel the freedom of the 44th Amendment to expose her killer? Fifty years earlier a young Assistant District Attorney Porter Chapman propels another man into a life where he would also have to fight for freedom. Chapman wins his first big case launching his political career and sentencing Timothy Drake to four consecutive life sentences in the newly sanctioned U.S. Federal Penal colony system. There, Drake befriends Chaplain Taylor who employs him to rid the colony of a religiously oppressive control system run by the colonists in a place where the life expectancy is less than 20 years, but Drake survives. The 44th Amendment: The American Way is a chilling tale of life in America as two men lives intersect early in their twenties and then again nearly a half century later as they struggle to define the ultimate meaning of freedom. Drake, imprisoned, fights for a spiritual freedom which has been denied him his entire life. Senator Chapman a distinguished and honored member of congress fights for freedom for all Americans through law. The characters of The 44th Amendment: The American Way are livid from the throws of an ailing American confidence in civil protection as the government, lawyers, private citizens, businesses, and the press must assess what is freedom under the 44th Amendment when they learn how the Data Wars started and who started them. 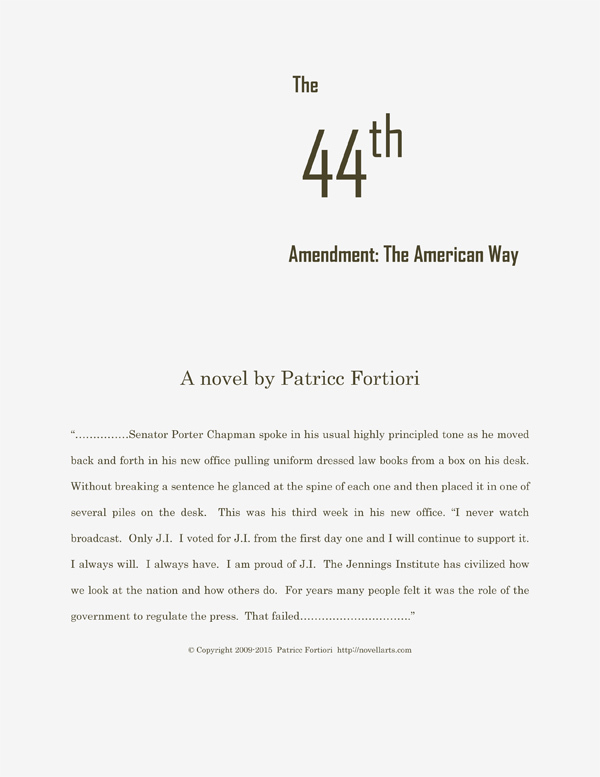 Written in a pleasurably stimulating allegorically reflecting language, the The 44th Amendment: The American Way captures and personifies an American future not far from where it is now. This novel is attractive to all fiction readers who embrace bold and fantastic commentary on American life with the lure of a classic murder mystery and the down fall of a tragic hero. A psychological thriller and gentle love story about a mother’s fight to hold on to a daughter as slips away to disease and not knowing what the disease has really transformed her into. Please leave your questions and comments for The 44th Amendment below.